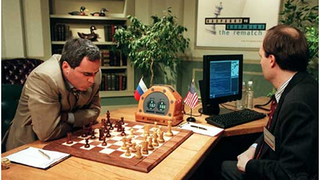 On this day in 1997, Garry Kasparov sat down to his final day of chess with IBM's Deep Blue. It didn't go well, and eventually the computer won, beating the expert on the final day of a six-game competition. The result changed the way we think about computer intelligence for good. Admittedly, it was the second time Deep Blue had been up against Kasparov, having lost the first time. And, yes, the supercomputer had been reprogrammed specifically to beat the Russian champ, using the input of several grandmasters and a detailed analysis of Kasparov's previous games. But Deep Blue piqued public interest in the limits of computer intelligence. It made people realize that computers could be more than just boxes. Since, IBM has upped its game, managing to take Watson to a victory in Jeopardy. What next? Can Watson&apos;s Mega-Brain Help Rid the World of Patent Trolls?